I really enjoy running math art workshops. 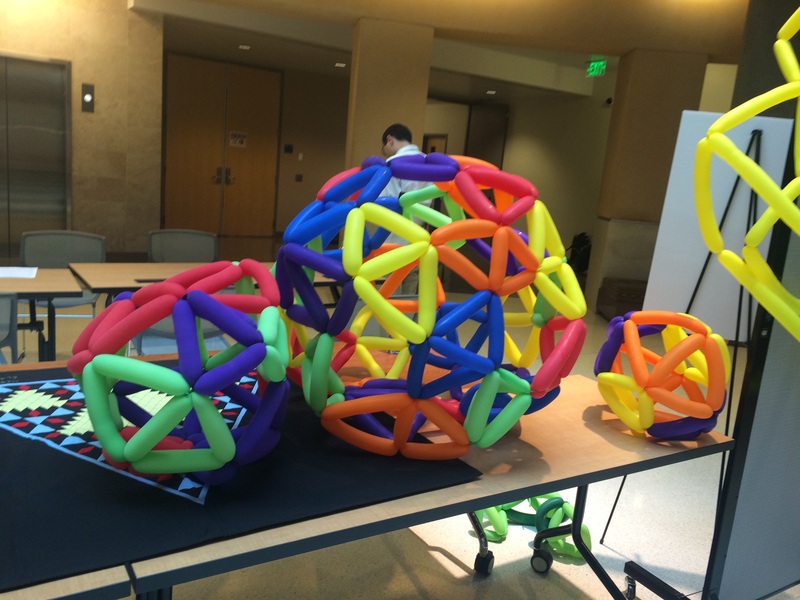 MoSAIC (Mathematics of Science, Art, Industry, and Culture) is a series of math art events being held around the country to get people interested in math. I was pleased to be able to participate in the very first MoSAIC Festival held at Berkeley City College last October. 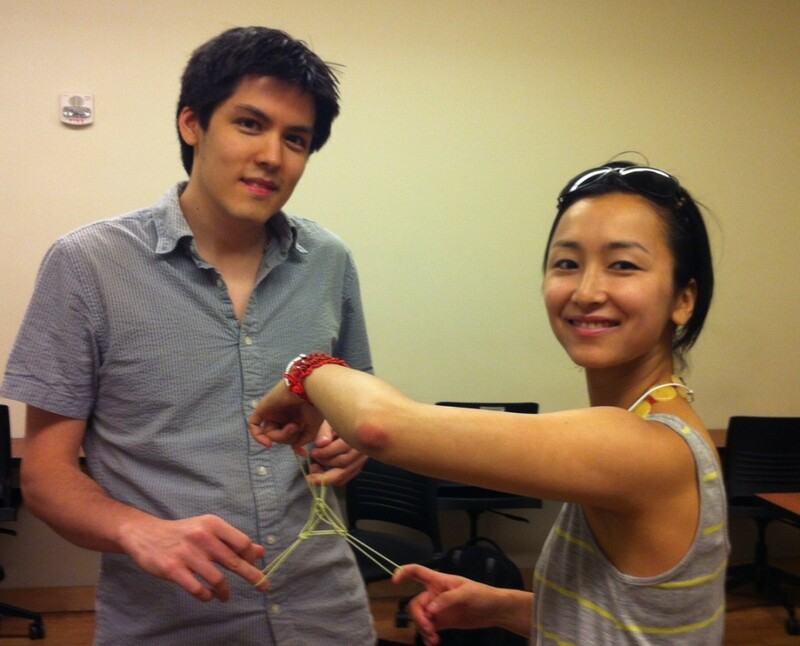 Vi and I ran one of her mathematical balloon twisting workshop on the first day. 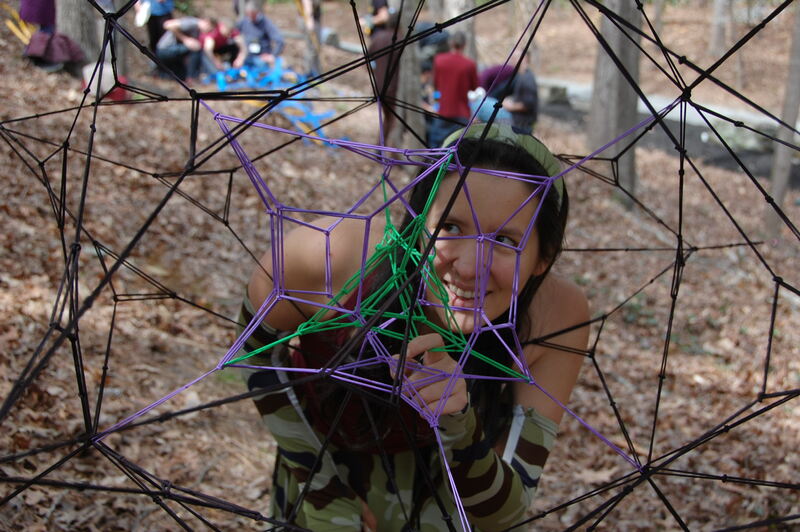 On the second day, I premiered a fractal hair band sculpture workshop inspired by Zach Abel‘s awesome rubber band workshops. 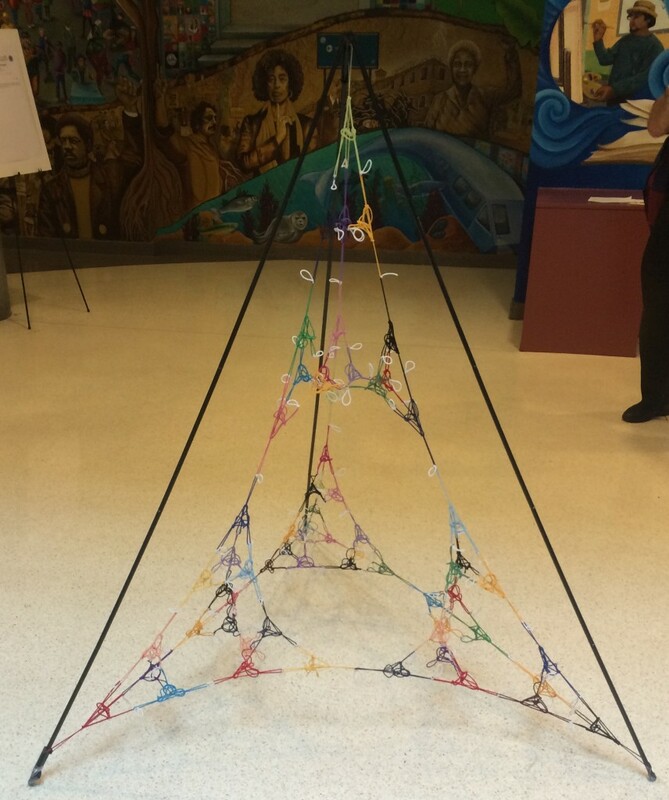 The Sierpinski tetrahedron is a natural extension of the Sierpinski triangle (which shows up in my blog quite a lot) to the third dimension. 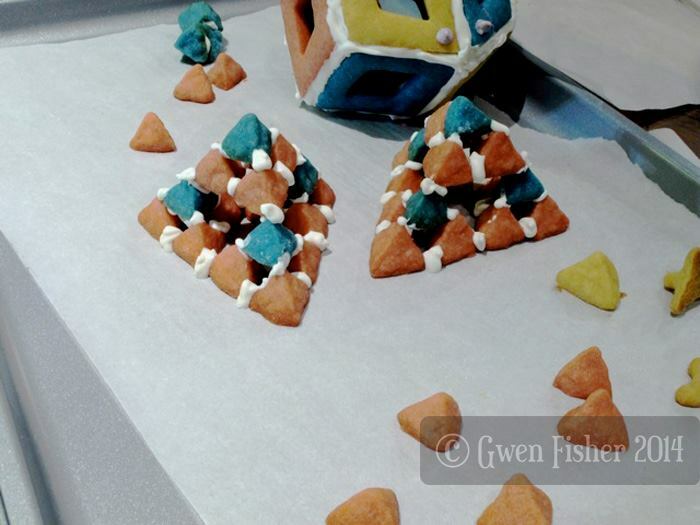 Here’s are some that we made out of cookie dough and frosting during our math cookie day last year. 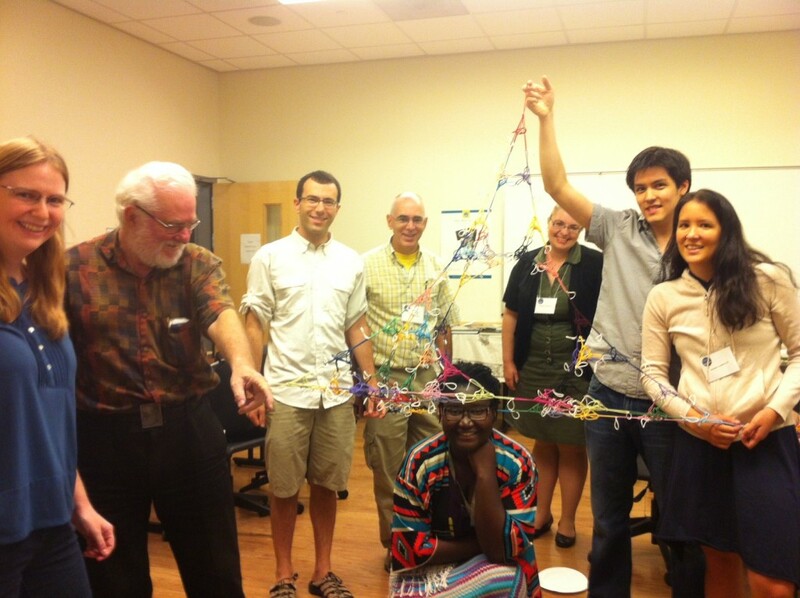 The great thing about workshopping a fractal structure like the Sierpinski tetrahedron is that all of the modules are the same, and the scope of the workshop can expand and contract easily with the allocated time and number of participants – you simply make a higher or lower order final model. 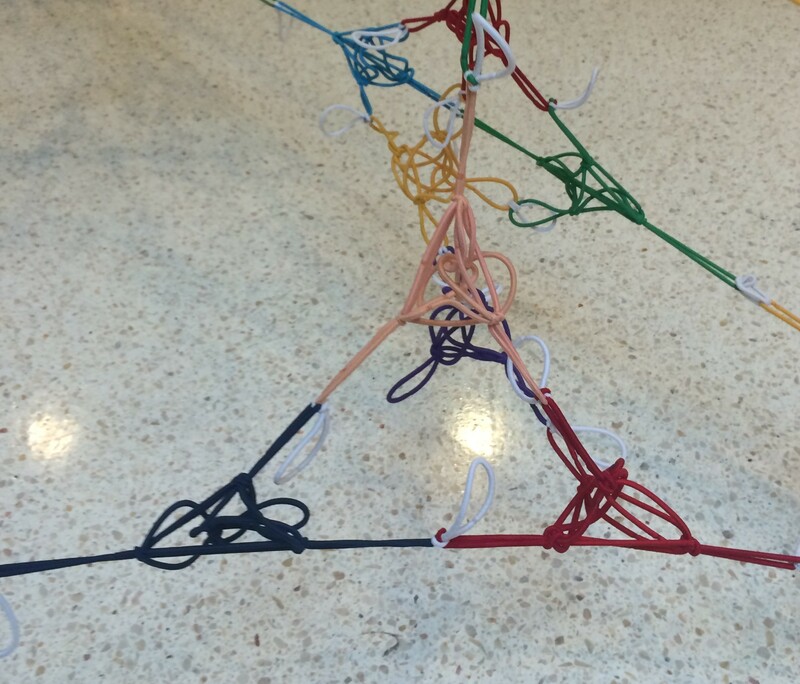 The level 0 tetrahedron module that I designed is made out of 10 hair bands and looks like this when stretched out. 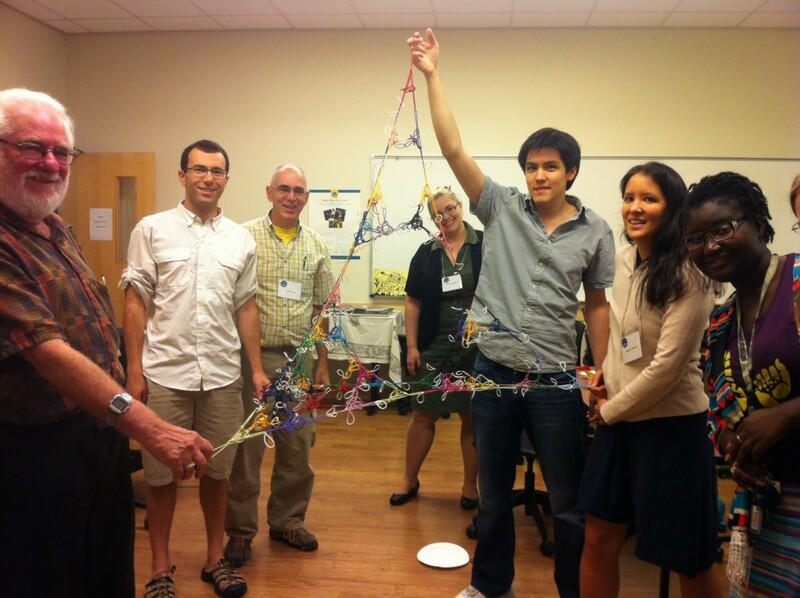 The level 1 tetrahedron is made out of four level 0 modules that are joined by extra white hair bands. 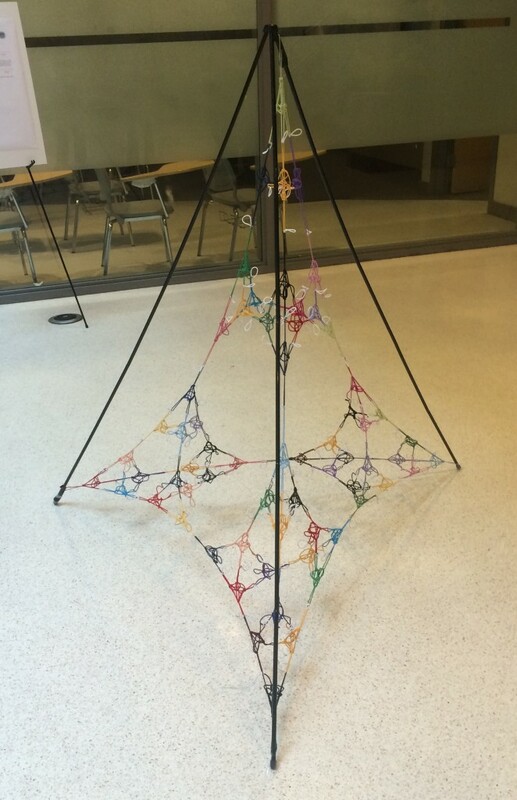 For some reason I seem to be missing a picture of the level 1 Sierpinski tetrahedron by itself, here is a close-up shot of the larger structure that shows two such tetrahedra (one in front of the other). 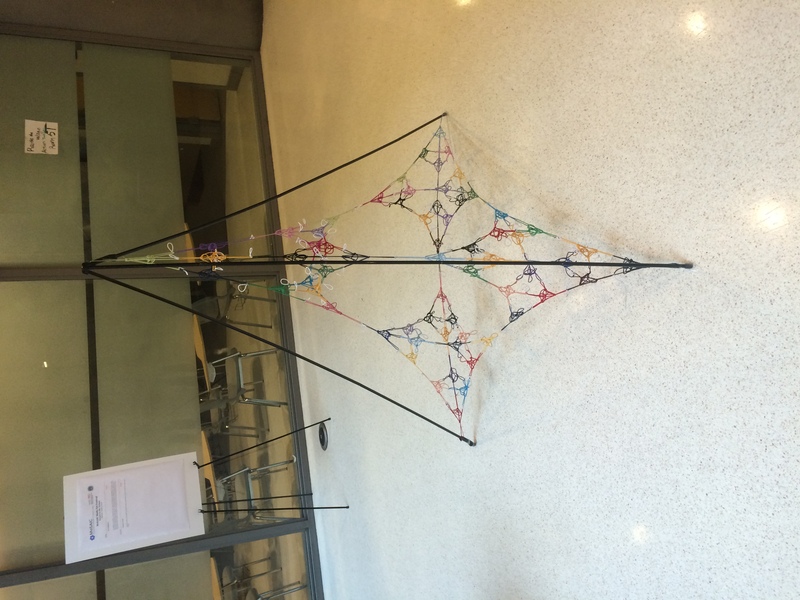 Similarly, the level 2 tetrahedron is made out of four level 1 tetrahedra. 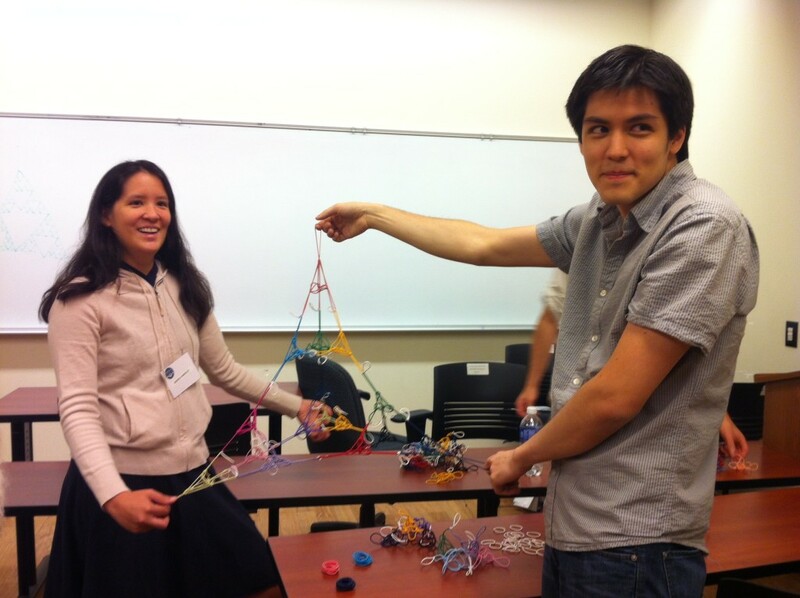 I ran two workshop sessions of an hour each and was hoping to finish a level 3 Sierpinski tetrahedron between the two of them. Like all hair tie and rubber band sculptures it has a fun bounce to it, although you still have to be careful not to boing too hard and break the hair bands. But, I don’t seem to have taken any video of us boinging it. So, instead, here is another shot of a bunch (but definitely not all) of the awesome people who came by and participated in my workshop along with our completed sculpture. It turns out that the sculpture looks great stretched out on a standard tripod poster stand that was hanging around. And George Hart took it with him to showcase at future MoSAIC events. I’m not sure if it’s still making the circuits, but if there is a MoSAIC festival near you soon, then you should definitely go and check it out (and let me know if you see this hair band sculpture)! This entry was posted in Life on July 28, 2015 by hawksley.